The Church is an odd duck horror film. A horror film with a message of salvation it is strangely toothless. The plot of the film has several members of a community trying to convince the pastor of a church to sell the property so that they can all make a killing because their, and the church’s property is wanted by group of developers who have offered to pay top dollar for it all. Of course efforts to change the pastor’s mind results in the release of spirits who end up in a battle with demonic forces… or something. Forgive me I kind of lost interest early. Blame the performances which are weak. Everyone seems to be acting or being a type. I’m not sure if they genuinely are weak or the result of the cast not really caring. Whatever the reason it just never works. There are no scares because you can’t be sure if the cast are for real or kidding or not. It doesn’t help that writer director Dom Franklin shoots this like a low budget horror film from the late 70’s or 80’s. You know the sort of films which were kind of anemic and weakly shot. The special effects involved lots of colored lights and okay process shots and/or practical effects. To be certain a good number of the films were entertaining (I have a large number in my collection) but at the same time a lot of them were bad or just missed. The Church misses. It never quite looks like anything other than a low budget film. The effects look like they are in time warp from 30 or 35 years ago. I was mostly bored. Yea, I made it to the end but it was a long slog to get there. 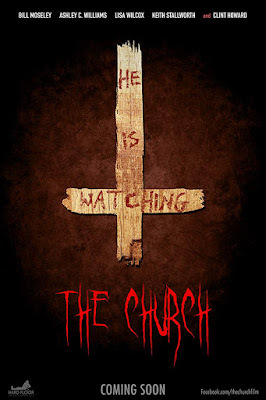 I can’t really recommend The Church unless you are a horror completeist who’ll sit through any film no matter how dull and boring.